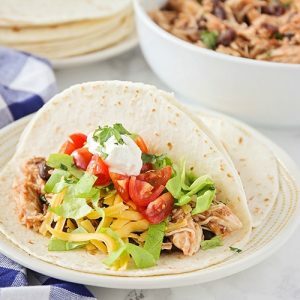 These crock pot chicken tacos are one of our very favorite meals! With only 3 ingredients, this recipe is easy to make and takes no time to prepare. Simply put the ingredients into your slow cooker, then sit back and relax! Taco toppings: lettuce tomato, cheese, olives sour cream etc. Place the chicken at the bottom of the crock pot. Pour the salsa and black beans over the top. Cover and cook on low for 6-8 hours. 1/2 hour before serving, remove chicken onto cutting board and shred with 2 forks. Return chicken to croc kpot and turn heat to high. Leave the lid off for remaining 1/2 hour to burn off excess liquid around chicken and beans. Depending on how much liquid your chicken distributes, you may even want to strain this a bit in a colander before serving. Sometimes it can be pretty runny and cause for a soggy taco! Serve in your favorite tortillas or taco shells and top with your favorite taco toppings!